What is “sitting shiva?” Who should visit? What is the role of the mourner? What is the role of the visitor? What is the role of the community? Shiva is the traditional Jewish way of dealing with the physical, emotional, and spiritual shock of a loved one’s death, and of beginning to honor the memory of the deceased. The word “shiva” means “seven” in Hebrew, because that is the number of days it traditionally lasts. (So, technically, those who sit a shortened period of three days, for example, aren’t sitting “shiva,” but “shloshah.”) The first day of the seven is the day of burial, and the last day traditionally ends with morning minyan. The duty of the mourners sitting shiva is to remember, mourn, pray, contemplate, readjust. Shiva is intended to prevent the mourners from needing to pretend either to others or to themselves that life goes on as usual and that “everything is ok.” It’s not. 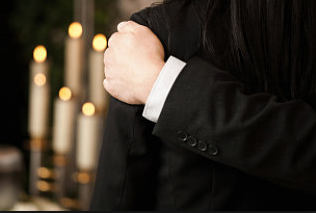 The mourner traditionally does this by staying home and just being with their situation as mourner. The duty of the mourner is certainly NOT to host. In fact, the opposite is true. The community traditionally hosts the mourners, although at the mourners’ own home. The first is to enable the mourners to sit shiva. This means enabling them to have no responsibilities except those I listed above – remembering, mourning, praying, contemplating, readjusting. In particular, they shouldn’t have to leave their house. Thus, rather than the mourner providing cakes for guests, or the guests providing cakes for each other, the traditional core food mitzvah during shiva is for the community to provide all the mourners’ meals. I note that this hasn’t been the understanding of either mourners or community members in our congregation, but I would encourage us to move in that direction. The other part of enabling the mourner to sit shiva is making sure there is a minyan in which the mourner can pray and say kaddish. It’s important to note that anyone can and should do the mitzvah of nihum avelim. You don’t need to know either the mourners or the deceased. Traditionally, it was recommended that those closer to the mourners come during the first three, more difficult days. But in our small community, where getting a minyan is not always easy, please come when you can. Traditionally, as I explained, mourners don’t do anything except sit shiva during the shiva. So people might come to feed and comfort any time, not just at service times. Obviously, one tries to be respectful and helpful, not intrusive. In our community, where people make various decisions about how to sit shiva, we’ll try to clarify when the mourners would appreciate visitors. That’s an overview of the community’s traditional role when a member of our community is sitting shiva. Now I’d like to focus on practices that pertain to the mourner. My understanding of these rituals and customs is that they can help us to adjust to the fact of a death in a psychologically healthy way, with dignity and beauty, and with the support of community and tradition. They constitute both an internal discipline for the benefit of the mourner’s spirit, and a way of honoring the life and death of a loved one. (Of course, Jews with a more traditional theology would also say that they are done primarily because they are commanded by God.) Among the insights that distinguishes Reconstructionism from classical Reform Judaism (and which the Reform have now largely come to share) is that our spirits grow and learn by the physicality and repetition of ritual, and by our connection through custom and ritual to the expansiveness of the Jewish people. While each of us makes our own decisions about these matters, I hope that you will allow yourself to be challenged/drawn in by the traditional practices. When we inevitably find ourselves in the position of a mourner, I hope more of us will choose to teach ourselves and honor our dead through the discipline of some of the traditional practices. a reduced attention to self, particularly to the appearances/masks that we maintain in public. honoring the life of the deceased and continuing their positive influence in the world. As I wrote last month, one of the purposes (or effects) of these practices is to discourage denial. The American and Christian cultures in which and next to which we live tend to encourage putting on a happy face as soon as possible after a death, even at the funeral itself, and continuing as if nothing happened. But Judaism values this world and our bodily existence in it, and even with a traditional understanding of the dead going to heaven, acknowledges that the loss of this-worldly life is a true and deep loss both for the dead and for the mourners. (My pluralism requires me to note that while I think this happens to be one of the areas where Judaism starts out at a better point, some Christian churches have done good work in this area, sometimes in response to the “stages of grief” psychological literature. And there are other things where it’s the Jews who have to do the extra work.) Jewish mourning practices help us truly acknowledge that loss, and thereby incorporate it into our own growth. During shiva, the first seven days, the reduced attention to appearances traditionally takes the form of covering mirrors and avoiding the following: cosmetics, haircutting & shaving, trimming nails except by tearing, and wearing new clothes. The avoidance of pleasure and celebration is extreme: one traditionally doesn’t go out at all, remaining at home or in the shiva house, except on Shabbat. Traditionally, mourners sit on low benches, or remove the cushions from sofas and chairs. Leather shoes were considered a pleasurable luxury and so are avoided traditionally during shiva. Bathing for pleasure, as opposed to hygiene, is considered too pleasurable. Of course, sexual relations are also considered inappropriately celebratory. Even too enjoyable Torah-study was to be avoided. During Shiva, one honors the dead by speaking of them and by saying kaddish during services. Kaddish honors the dead by praising the One that gave them life, and by praying that that One’s sovereignty be manifest in all our lives. In this way it affirms the meaningfulness of their life, and prays that that meaning may continue. During the first 30 days from burial, although mourners return to their normal work routines, some of the above restrictions and customs remain: Traditionally the reduced attention to self-appearance is maintained in regard to not cutting the hair, shaving, trimming nails, or wearing new clothes. The avoidance of celebration continues during the 30 days, although our tradition includes a disagreement about what kind of celebrations are to be avoided. Some say celebrations of “true joy,” which the tradition understood to be religious celebrations, such as weddings. Others say the opposite: of course you attend religious celebrations, but not celebrations that are just for fun: plain old parties with music and dancing. Most Orthodox will avoid both during the shloshim, the 30 days. To honor the dead, and continue their effect in the world, kaddish continues to be said at services, and special attention might be paid to engaging in Jewish learning, tsedakah, and good deeds. Ritual mourning for all relatives other than parents traditionally ended with the end of the 30 days (except for annual occasions as explained below). This was in a world where death was more common, and the disruption of full-year mourning for children and spouses would simply have been too great. The distinction, I think, stemmed from the command to honor parents, rather than from any greater level of affection for them. Nowadays, many people, including Orthodox, I believe, extend their mourning for spouse or children beyond the 30 days. avoidance of celebrations (with the same disagreement as above). Kaddish is said for 11 months. After the 12 months (or the 30 days), ritual mourning practices are restricted to five annual occasions. These occasions are: the anniversary of the death (usually observed on the Jewish date, and called in Yiddish “Yahrzeit”), Yom Kippur, Shmini Atzeret (at the end of Sukkot), Passover, and Shavuot. At each of these occasions, one lights a 25-hour candle in the evening, gives tsedakah, and says kaddish at services. (During the festivals, one says kaddish as well as other memorial prayers during the special “Yizkor/memorial” service.) Other traditional ways to honor the dead at the yahrzeit (and at the end of shloshim), are leading services or giving a dvar Torah – doing some Jewish teaching. I would love to have people engage in these traditions, and would be happy to help guide you if you wished. People also will visit the grave as a way of honoring the dead, and learning from their life and death. One can visit any time, although the days before holidays are particularly appropriate. That summarizes the traditional practices and their rationale. If you have more questions or are interested in more details, let me know. I can answer questions or point to resources. I do believe that these traditions are appropriate, beautiful and enriching, and I hope more of us will take on more of them. As you make your modern choices of how to mourn, please consider the principles involved: avoiding denial, avoiding attention to self-appearance, acknowledging that respect for the depth of loss implies some limit on celebration, and honoring the dead in public. Please consider making this a discipline and a way to connect to community, the Jewish heritage, and God. I’d be happy to help think about making choices that are modern yet true to the tradition. Finally, I have to admit that I’ve been quite surprised that so many people do not come to synagogue for yahrzeit and yizkor. It’s a good practice; I hope I’ll see you next time.